Ohio does not have laws that protect our workers from being forced to join union organizations when they take certain jobs. We want to amend Ohio’s constitution to say that no person can be automatically enrolled or have money automatically taken out of their pay checks by any organization. Certainly, some union organizations have gotten a head start on this ballot issue movement by using middle class worker’s money to pay for billboards and online ads that ridicule Workplace Freedom. These advertisements are unprofessional, inflammatory, and ridiculous. We see these ads as well. Like most people who have seen them, we are confused by them. 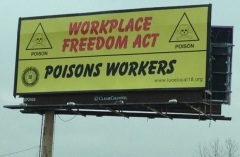 Even if you do not agree with it, how would Workplace Freedom “poisons workers?” Are workers “poisoned” in the 25 states that have these laws? To us, this just does not make any sense, even from their point of view. It is difficult to respond to a statement that simply makes no sense. We are also not sure what the Workplace Freedom “lie” even is. Possibly, they are referring to the view, held by a strong majority of Ohioans, that Right to Work is good for workers in Ohio. Obviously, a person’s opinion is not a lie, it is an opinion. Calling someone a liar rather than addressing their argument is an “ad hominem” and an undignified tactic. Perhaps such attacks are a reflection of the merits of their argument? We find such advertisements amateurish and degrading to public debate. Obviously, the point of these advertisements is not to engage in a serious conversation. It is to demean and delegitimize the majority of middle-class Ohio workers who support Workplace Freedom. This is the same type of political bullying that Workplace Freedom intends to protect workers from. No, this movement is absolutely not “anti-union.” That does not mean we expect union leaders to openly support this movement, but we do expect a significant portion of union members to support it. This is because this movement seeks to restore their First Amendment right to Freedom of Association. In practice, this would forbid automatic, involuntary enrollment of workers into labor unions or involuntary deductions from worker’s paychecks. Unions should have to persuade workers to join their organizations like every other type of organization. How Do We Respond to Union’s “Free Rider” Argument? It is clear that some unions have a spending problem, not a revenue problem. Many union leaders have made the argument that workers should not be allowed to opt-out of joining unions or opt-out of paying dues to them. Some prominent Ohio politicians have even openly called such workers “moochers” or “free-loaders.” They say that workers should not get the benefits of union membership, without paying for them. We do not believe such rhetoric is an accurate or acceptable description of Ohio workers. First, many workers seriously question whether their union’s activities have benefited them in a way that justifies the union dues. Second, many well-funded organizations and associations are comprised of only voluntary members and work on behalf of others using only voluntary contributions. Each union should have the same burden as any other association: to persuade people to join and contribute. We oppose involuntary enrollment and deductions. Unions spend massive amounts of this forcefully collected money in political races. The overwhelming majority of union spending goes to one political party, the Democrats. Second, reports have also shown that union leaders are collecting paychecks far larger than the average, hard working Ohioan. We do not believe that sends the right message to Ohio’s middle class workers. Third, as shown above in “Is Workplace Freedom a Lie?”, some unions are spending hundreds of thousands of dollars of their member’s dues on running advertisements online and in billboards that are defamatory and an embarrassment to the proud tradition of unions. Not only are these ads false and defamatory, but they are a clear abuse of the trust of their members. Many members do not agree with the content of these ads and do not want to pay for them. They are a clear example of what Workplace Freedom is all about. Since unions are spending so much money on political races, their own compensation, and defamatory ads, it is clear that the unions’ problem is spending, not collection of dues. This Workplace Freedom Rights movement is not a Tea Party movement. Our goal is to unite a strong majority of all Ohioans, from all backgrounds, so the Workplace Freedom movement may include the Tea Party among many groups who support Ohio workers. Efforts at passing “Right to Work” laws have been ongoing since the 1950’s throughout America. There are currently 25 states in the U.S. that have Right to Work laws. This includes two recent additions that border Ohio: Michigan and Indiana. To remain competitive with these border states, Ohio must pass a Right to Work law as well. To review our view on the economics of Workplace Freedom, click here. People of all passions have the right to stand up for what they believe in and we strongly encourage that. In fact, the whole point of Workplace Freedom is to allow Ohio workers to stand up for what they believe in, whether others agree or not. No person or group should have the ability to force others to pay to advance their own viewpoints. As for us, we respect people who hold views we do not agree with. As for our movement, we know that Right to Work is supported by a strong majority of Ohioans. We know that it is supported by a strong majority of elected officials in Ohio. We see no reason that this Workplace Freedom movement cannot unite a strong majority of all Ohioans, from all backgrounds.